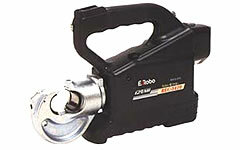 REC-3410 Battery Operated Tools: Izumi Products. 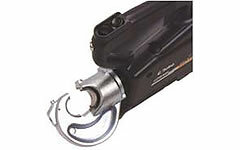 The REC-3410 is the battery operated 12 ton tool to accommodate 12 ton shell type dies widely used in the industry. Portability and handling a improved and it now features a new, larger handle opening with a rocker type advance/retract switch located on the top of the handle for one figured operation. It also incorporates a built in foot base with finger indents for easier handling when working overhead or underground. The new rapid advance system reduces tool run time giving you more crimp cycles per battery charge. The number of crimps per charge for maximum conductor : 37 crimps/BP70-E. This tool is designed to accommodate shell type dies for applying compression fittings to copper, aluminium and ACSR conductors.